Unlimited available Complimentary (Free) 90 Minute aPHR, PHR, SPHR, SHRM-CP, SHRM-SCP Exam Prep Webinar (4/19/2019) Free Join Elga and Mike for a Complimentary (Free) 90 Minute PHR, SPHR, SHRM-CP, SHRM-SCP Exam Prep Webinar on Friday April 19th 2019 from 2pm to 3:30pm EDT! 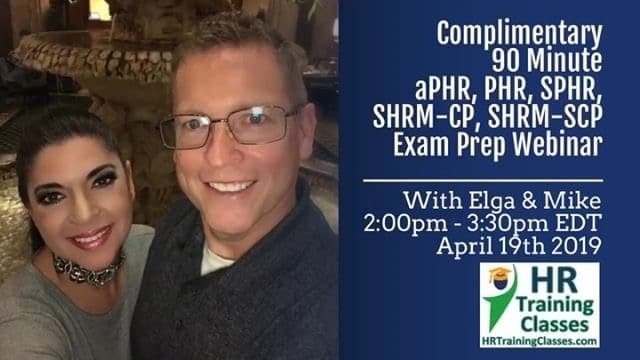 Join Elga and Mike for a Complimentary (Free) 90 Minute PHR, SPHR, SHRM-CP, SHRM-SCP Exam Prep Webinar on Friday April 19th 2019 from 2pm to 3:30pm EDT! 15 years ago having an HR Certification was hot and it seems that this fever is not going away! Today more than ever before, the letters “aPHR, PHR, SPHR, SHRM-CP, SHRM-SCP” after your last name are held in high regard. We just need to browse the HR job postings to know that this is true. Most of the HR Management, HR Director and HR Generalist Positions list under “Preferred Qualifications” PHR / SPHR or SHRM-CP / SHRM-SCP Preferred and in some cases it’s required! We live in a very competitive market and we know that for every one of these positions recruiters receive hundreds and hundreds of applications. HR Professionals with no HR Certifications are in at a disadvantage but that can be easily corrected by getting your HR Certification which will give you the credibility that will move your resume to the top! According to a survey done by Payscale.com, HR professionals who are certified make substantially more than their non-certified counterparts. According to Payscale’s survey, the pay difference for a certified HR professionals compared with those without certification is nearly $20,000 difference. Let’s say an average of 30 years that an HR Professional will work during his or her life, that is a total of $600,000. Yes, it is true that numbers vary across different industries and parts of the country, but on average undoubtedly, the certification pays off big! We tend to think that certification sends a signal that the individual is committed to the profession and competent in the field, after all, you have proven you have mastered the body of knowledge in Human Resources. Supervisors report certified HR Professionals are more effective at carrying out strategic HR tasks and have more expertise. When you have a certification, people will respect you more, your recommendations and your decisions. Additionally, your certification increases your professional confidence, sets you apart from your peers and you gain new skills from the prep process. Higher career satisfaction is observed in HR Professionals who hold Certifications which result in higher HR employee engagement which creates a domino effect resulting also in higher overall employees’ engagement.